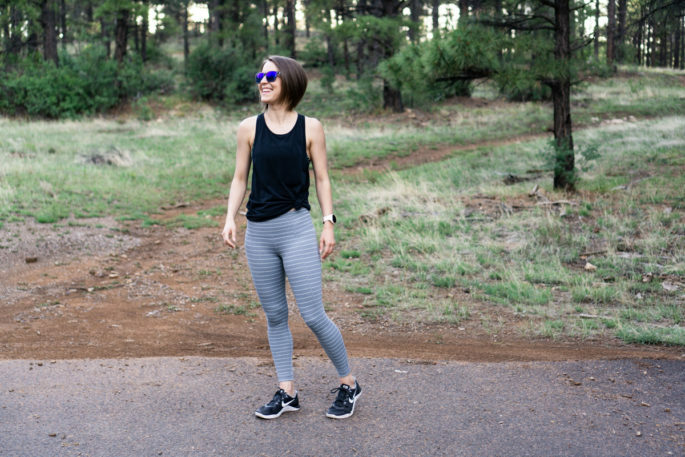 Striped leggings are a staple of my active wardrobe–I’m always willing to add another pair to my collection. 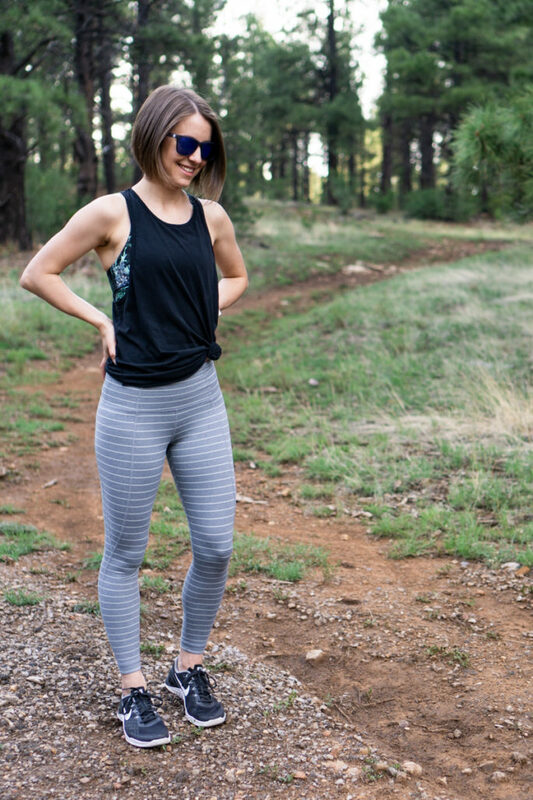 I had tried two pairs of Athleta’s powervita tights before and neither worked, but these stripe salutations lured me in for another try. This pair finally makes it clear what all the fuss is about! A lot of people have said that powervita is similar to lululemon’s nulu, except powervita holds you in. I definitely agree, the powervita is much sturdier. 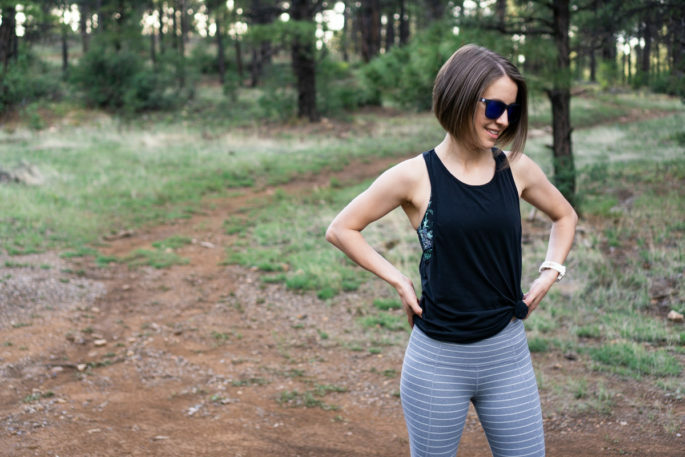 It still feels incredibly light, flexible, and easy to wear, but it doesn’t have quite as much of a barely-there feel as nulu. Both fabrics are great, so whether you like one or both just comes down to personal preference as well as what you’ll be using them for. Powervita is more appropriate for medium or even high impact workouts compared to nulu. The striped pattern is woven into the fabric, it’s not printed on. This means that when you stretch the fabric, it doesn’t fade to white, and the inside of the fabric looks the same as the outside. I can bend, squat, or do absolutely anything, and these are still 100% opaque. I struggle with not-quite-perfect coverage with lululemon’s aligns, so I’m very pleased with the fabric quality on these salutations. In my opinion, the grey color is darker than how it appears on Athleta’s website. It’s a cool-toned, medium grey. Also, since it might not be obvious: the stripes are a lighter shade of grey, not a crisp white. I’d love to see these in more colors, like black and white or berry and white. I bought these tights in XXS, my usual size in Athleta. In my opinion they fit true to size (the XXS is similar to a lululemon 2). The 7/8 length is absolutely perfect on me. At 5’3″, these fall about an inch above my ankles. This length looks great since it is smooth with absolutely no bunching or wrinkling at the bottom. Note that these are the regular length, not petite–the petite length is 2″ shorter. Also, no baggy ankles! Hooray! I couldn’t be happier with how the lower legs fit. The rise is high, but not the highest I own. It falls about an inch below my belly button. Note this is lower on me than it appears on the Athleta models, and I’m on the short side. The waistband is double-layered for support. It’s also extra-wide, which I like. There’s one large pocket on the inside with a little flap over the top. The pocket is large enough for a credit card or keys, but not large enough for a phone. Wondering if these show sweat marks? Good question! I don’t wear these for super-high sweat activities so I am not sure. Sorry I can’t be of more help! I bought a pair and was not happy with the fit. I’m 5’4” Sz XXS also. They felt uncomfortable on my waist. I wore these for a HIIT class and the waist felt awkward the whole time. My waist is 24” . I felt like they were digging into my waist. I also didn’t like the feel of the fabric when I Got super sweaty. Maybe the waist hits me on a different area since I’m a little taller? That’s the only thing I can think of. Thanks Jen! :) It comes out just a little differently each time, but lately I’ve been liking it a lot. It’s funny – the striped pair are my least fave pair because I find the fabric to be inconsistent with the rest of the line (for reference I own 11 pairs of salutations not including the stripes). I thought they were a bit stiff and weren’t as comfortable as all the others. 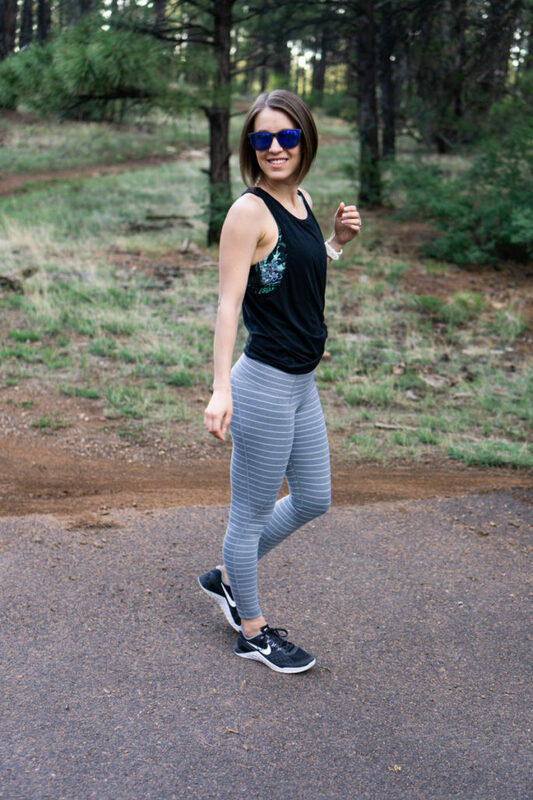 You should review the new Elation capris and the new running tights! I’m excited for the new designs and fabrics they’re doing. Thanks for the input! Funny you mention the elations, I actually just received an order with 3 pairs and tried them on today!! Couldn’t decide on color/length, so I ordered all of them, haha. They are amazing. Aubergine is *stunning* IRL. I used to be underwhelmed by Athleta, but they are knocking it out of the park with every order lately. I don’t know if I can bear to return any of them. Love those striped leggings! They suit your body type well and pair great with that black top. Also, it is great that there is a little hidden pocket. 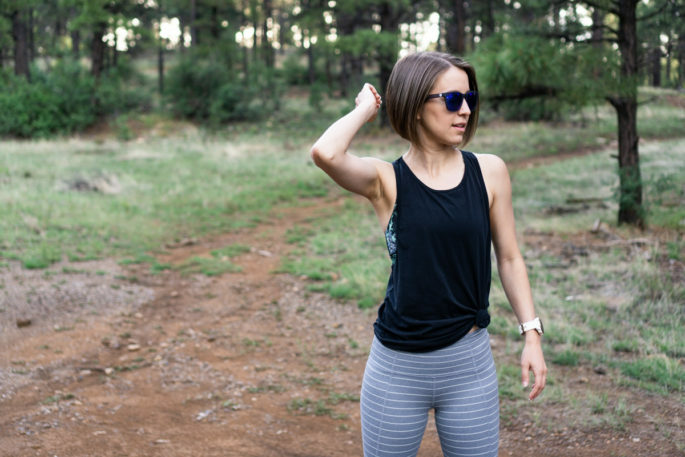 it’s always useful to have pockets in athletic wear especially if you’re going on a long run. Thanks Jennifer! I’m always a fan of pockets–there’s always something I’m hauling around! What’s the difference between the Elation and the Salutations? Would you recommend one over the other?